The roots and leaves contain vitamins and minerals and are an excellent diuretic, and the flowers can be infused to make wine. The plant is a close relative of chicory, and its roots can be roasted to use as a caffeine-free coffee substitute. The main constituents in the dandelion that account for its health benefits are bitter sesquiterpene lactone compounds, some of which are unique to this plant. The leaves contain vitamins A, C, D and B complex, as well as the minerals iron, zinc, magnesium, potassium, copper, calcium, chlorine, silicon and boron. The flowers are rich in carotene. The roots contain taraxacin, a crystalline, bitter substance; taraxacerin, an acrid resin; inulin, gluten, gum and potash. Both the roots and the leaves of the dandelion are high in nutrients and are commonly used as natural remedies. Several studies show that dandelion root supports liver health, may help reduce cholesterol and, as an antioxidant, help fight disease, even cancer. Dandelion root also has antimicrobial properties that can help stop the growth of disease-causing bacteria. Dandelion leaves are a diuretic, supporting kidney function by helping the body to excrete excess water (often used in conjunction with horsetail), and promote weight loss. Dandelion leaves may also promote eye health, help protect the liver and lower triglyceride (a type of fat) levels in your blood. Support the kidneys and liver, helping the body’s elimination functions. Act as a diuretic (to decrease water retention). Dandelion is often combined with other diuretic agents such as horsetail to intensify results. Stimulate bile flow, helping to prevent gallstones. Act as a tonic and stimulant to remove the toxins and poisons that cause inflammation in the joints, relieving the symptoms of rheumatism, arthritis and other types of chronic joint pain. 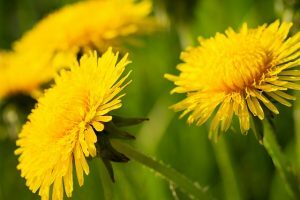 Dandelion may help prevent osteoporosis. Act as a digestive stimulant. Act as a mild laxative. Support the function of all major organs in the body – liver, gallbladder, kidneys, bladder, pancreas, spleen and stomach. May help lower ‘bad’ cholesterol in the blood. May have beneficial effects in treating colitis and diabetes. Although dandelion has no known serious side effects, in large doses it may cause upset stomach or skin rash. Always consult your medical practitioner before taking natural remedies, especially if you have existing health problems, are pregnant or breastfeeding, or are on medications. Do not use the dandelions that grow in your garden. These have hairy, dull green leaves and a solid stem; Taraxacum officinale has light green, deeply indented leaves, a hollow stem and daisy-like flower petals with bracts that are open in a distinctively downward-turning manner. Purchase organically grown plants from your health-food store or holistic garden centre. Steam the flowers and young leaves as you would spinach – they have a pleasant, slightly bitter flavour and are perfect in salads, especially when dressed with the pan oils left from frying bacon. You can also sauté the leaves with olive oil and garlic. The flowers are good for making wine. Taraxacum officinale is a hardy perennial that can be grown in most areas in South Africa, except at the coast. Plant organic seeds from your healthfood store or holistic garden centre in full or partial sun in any soil type in deep window boxes to avoid the plants spreading. Cut off the flowers before they go to seed. Dandelion is a good companion plant because it adds minerals and nitrogen to the soil, and also attracts beneficial insects to the garden.